“All right, there we go.” With those words and a swish of his pen, President Barack Obama reversed one of the most controversial executive orders in recent history. In front of the country’s leading scientific minds, including Dr. Francis Collins, who helped map the human genome, and Dr. Harold Varmus, former head of the National Institutes of Health and a science adviser to the Administration, President Obama fulfilled a campaign promise to lift the ban on federal funding of embryonic stem cell research put in place by President Bush in 2001. Obama’s new executive order now allows scientists to apply for government grants to study the versatile cells. While decisive, the order can still be reversed by a future President, so Obama urged Congressional leaders to seal the intent of his order into law  a process that Congresswoman Diana DeGette of Colorado has already begun. DeGette co-authored two previous bills expanding taxpayer support of embryonic stem cell research, both of which President Bush vetoed. The sigh of relief in labs across the country was almost audible. In Boston, Douglas Melton, co-director of the Harvard Stem Cell Institute, gathered his entire staff to listen to Obama’s announcement and served cake in celebration. James Thomson, the University of Wisconsin scientist responsible for isolating the first human embryonic stem cells in 1998, flew to Washington at Obama’s request to watch the signing in person. The President’s decision does much more than expand funding for stem cell research. It heralds a shift in the government’s view of science, ushering in an era that promises to defend science  and the pursuit of potentially useful treatments  against ideology. “It is about ensuring that scientific data is never distorted or concealed to serve a political agenda and that we make scientific decisions based on facts, not ideology,” Obama said in his opening statement. Without discounting the moral concerns that many Americans have in regard to using embryos  which many consider to be fully realized human life  for scientific research, Obama said that moral values do not necessarily preclude the study of embryonic stem cells, particularly those obtained from the pool of 400,000 or so embryos currently stored in IVF clinics around the U.S., most of which will be discarded. “I believe we have been given the capacity and the will to pursue this research  and the humanity and conscience to do so responsibly,” he said. Obama’s executive order also means that federally funded scientists who were interested in studying embryonic stem cells, but could not afford duplicate facilities to store and experiment on them , can now do so. “I already have e-mails from scientists in this country, asking to get in line to have us send them cells,” says Melton, who used private funds to create 70 new lines after the 2001 ban and made them available for free to any lab that could study them. There is also a more practical release. For many scientists who continued to receive public funds while pursuing embryonic stem cell work with private money, the federal restrictions meant they had to segregate their two universes completely: not a single penny of government money could be used for embryonic stem cell work. Lab personnel had to log each minute they spent studying embryonic cells and had to keep all equipment, from computers to pens and pipettes, separate. Often, different lab facilities had to be built to avoid any potential crossover of funds. Melton’s embryonic stem cell work was relegated to a 250-sq.-ft. basement room on Harvard’s campus, and every piece of equipment was stickered to remind users whether it was bought with federal or non-federal funds. At the University of California, San Francisco, stem cell researcher Susan Fisher can finally unify her divided lab space. “You walk down the hall of my lab, and on one side is the federally funded work, and on the other side are duplicate facilities for non-federal work,” she says. If the fanatic bookkeeping sounds excessive or paranoid, Fisher assures you it isn’t. In 2003, she published a study involving embryonic stem cells in the journal Science. The paper appeared online at noon, and within a few hours, she received an e-mail from a Congressional staffer containing an exhaustive list all of her NIH grants, and asking which had been used to support that study. “It was my first realization about how closely the government was watching,” she says. 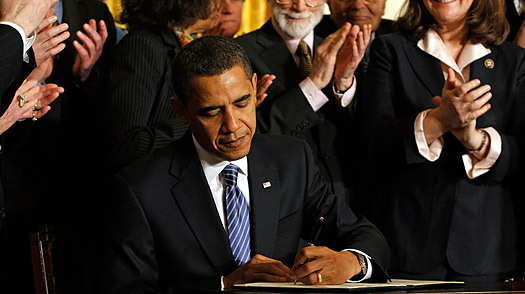 Still, Obama’s executive order leaves intact a 1996 law, the Dickey-Wicker amendment, which bans the use of taxpayer dollars to create embryos solely for scientific study  for stem-cell or any other type of medical research in which the embryos would have to be destroyed. Without being able to create embryos and their stem cells specially for individual patients, however, researchers say there is a risk of incompatibility between patients and any stem cells created from unrelated embryos. Even though embryonic stem cells can be guided to become any type of cell in the body, if they are transplanted into patients  as insulin-producing cells for people with diabetes, for instance  they must be tissue-matched to the patient to eliminate the risk of rejection. So for now, any practical benefit of having more embryonic stem cells exists only in the lab, not in the clinic. As welcome as the reversal is, some researchers grumble that it is too little too late. Since, and in spite of, the ban, scientists have achieved remarkable advances in stem cell science, which may one day obviate the need for embryos altogether. New techniques in generating stem cells from skin cells may prove in coming years more efficient and reliable than using embryonic stem cells. But Monday’s executive order is less about pitting the promise of one type of stem cell against another’s. It is more about reestablishing the authority of science, of ensuring that any and every potentially useful avenue of research will be pursued to its end. As the President himself noted, the new policy will not guarantee stem-cell treatments for diabetes, Parkinson’s or Lou Gehrig’s disease. But it does guarantee a commitment to the kind of promising research that this Administration  and many in the scientific community  believe must be followed.